Scrap copper prices fluctuate regularly and it is helpful to always get updated with the latest listings so you can be competitive with business endeavors. One of the easiest ways to get the current scrapcopper trends is to periodically check the latest news in the internet. Regularly getting informed of scrap copper prices allows you to get the best deals out of the scrap metals you have been saving. Scrap prices has been fluctuating around during the past year and though the trend may pretty much be the same this year, it is still very helpful to get daily updates. Prices may differ depending on the quantity of scrap products you have for exchange. Generally, larger quantities of scrap copper receive much larger compensatory value in reference with the price per pound ratio. One main factor that determines scrap copper pricing is the amount of product available in the market. There is basically a shortage in the availabilityof mined copper and if the demand for copper products is increasing, the price will surely rise higher by the day. Another factor that influences scrap copper trending is the amount currently needed by buyers in themarket. There are times when the demand for scrap copper is particularly high thus the supply/demand curve favors scrap copper dealers. Withholding scrap metals until they reach a sufficiently large quantity before selling them may be a good way to get higher revenue out of your items. The activity of the mining industry significantly affects the price of non-ferrous scrap metals. It is thus important to monitor the current trends and movements of the mining industry as their activity greatly shifts the price of scrap metals anytime. Negative indications of scrap copper selling include labor strikesand popularization of technological innovations which compete with the copper industry. When selling scrap copper, talk to us first and get expert advice on the industry. Scrap Metal Sydney can help you obtain great prices for your scrap metal. What is scrap copper recycling? Scrap copper recycling is the collection of and subsequent melting of unusable sections of sheets from which the desired shapes have been cut, excess length of, and obsolete copper and rods, and copper plates from all sources imaginable. Why is scrap copper recycling great for the environment? Scrap copper, if un-recycled would first be dumped in landfills. And when our landfills are full to the brim, scrap copper will be dumped anywhere and everywhere, so scrap copper recycling is great for keeping the environment free of copper scrap. As with other metals used in heavily in the world, the mining of ores containing copper is also widespread and carries various risks to human populations and the environment. If we needed to mine less of it since recycled copper is readily available, then we spare ourselves and future generations from a lot of the effects of environmental strain that goes with the search for this reddish brown metal. Copper recycling began with the advent of things made copper; however, scrap copper recycling on a large scale only gained steam during the Industrial Revolution in the 1800s and it never stopped since. The discovery of fossil fuels or petrol has made the heating of massive furnaces possible that in turn made more production and recycling of copper possible. The two World Wars of the 1900s have made the demand for recycled copper especially high and as a result, copper ore began to be more extensively mined more than ever. With the widespread use of electricity around the world and in the manufacture of electrical appliances, the world’s copper supplies were overwhelmed and still are. Scrap copper recycling became common and copper prices are seasonally affected by supplies of the metal in the market and this is true anywhere in the world, even in countries that export copper. 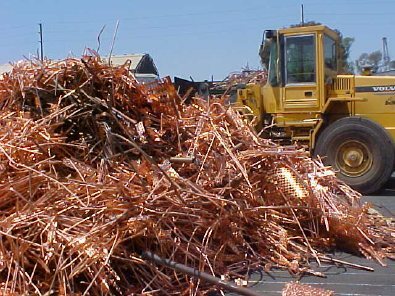 Why choose Scrap Metal Sydney for scrap copper recycling? At Scrap Metal Sydney, we take recycling seriously and we have invested in technology to bring you the best scrap copper recycling facilities in the country. Aside from being a leader in scrap copper recycling, we at We at Scrap Metal Sydney care about our staff from the employees to the top and their families and enforce safety precautions at all levels of scrap copper recycling. The ethos of Scrap Metal Sydney is to serve the community by heading scrap copper recycling in Sydney using the safest and most innovative practices and facilities to give life to old and new scrap copper. Recycling is our business and we are proud of it. You can rely on Scrap Metal Sydney to produce durable metals from old and new scrap. Copper recycling has been one of our specialties for a long time and we intend to continue being a leader in scrap copper recycling.